"It’s so important to bring this story back. We’re told that it’s all about apps, but it’s actually about the reorganization of work, corporations and work, that begins in this moment that defines our lives today. "In the 1930s, of course, there was the Great Depression that led into World War II. Coming out of that, Americans wanted security and stability pretty much more than anything. And during the 1930s, we had great clashes between labor and capital, as we used to call it, where we saw workers begin to organize themselves in new ways through the CIO [Congress of Industrial Organizations]. The United Auto Workers faced down the largest corporation in the world, General Motors, and demanded a contract. And then a few years later, that is ratified in law. "Coming out of World War II, there’s a new kind of industrial democracy, where everybody is supposed to get a stake in this prosperity. Now, not everyone did, of course. Who was included, who deserved security, were white men. And that’s an important thread through all of this, about who gets access to that security, who counts, who is inside and who is outside." "The full spectrum of flexibility runs from people at the very top — independent people with lots of in-demand skills that make a lot of money, that fly around the world — to people at the bottom, who are also moving around the world, but as economic, undocumented migrants. And both of them are essential to the construction of this new economy. “Even for those who get rich, it's kind of a shallow substitute for what I think the real American dream is, which is self-determination. I think a lot about how, in the 19th century, the dream was to have a farm, to be independent, to be on the frontier. But that gets substituted with a house in the 20th century. But the house is not a site of production — you still have to go to work, you still have to go to an office or a factory. And in a lot of ways, we traded, in that post-war period, we traded autonomy for security. “I think it’s important to realize that the apps, and this sort of on-demand economy like Uber, are not creating this condition. They are taking advantage of it. Uber is the waste product of the service economy. That the alternative to Uber is not having a good union job or having a secure job in an office, it’s slinging lattes at a Starbucks, wondering if you’re going to get enough hours that week. "This is why it’s also important to look back to the 1930s — it wasn’t just enlightened despotism or enlightened corporate leadership, however you want to call it. It was workers demanding an alternative. And so it’s workers — we think of the AFL-CIO as one organization now. Well, the CIO broke away from the AFL in the early '30s to organize the industrial workforce, as opposed to old types of craftworkers like carpenters and bricklayers. And it’s through their auspices that this new social compact is made. So, it’s corporate leaders, but in the face of overwhelming power from workers. Job insecurity is both what is new and what has become expected. Even where old-fashioned permanent jobs remain, workers must content with a new truth: they can be replaced with a phone call. Americans cannot typically rely on just one job anymore, certainly not over a lifetime, and—for the working poor—frequently not even at one time. Though day laborers, office temps, and management consultants—as well as contract assemblers, Craigslist freelancers, adjunct professors, Uber drivers, Blackwater mercenaries, and every other kind of worker filing an IRS Form 1099—span the income ranks, what they do have in common is what we all have in common in this post-1970s economy: they are temporary. Just as our business and policy leaders make choices to bring about this insecurity, we are at a moment when we can once again choose to remake our economy. To do so, however, we must confront some uncomfortable truths about how American capitalism has been remade from top to bottom. For some, the rise of the gig economy is liberation from the stifled world of corporate America. It is a return to the autonomy and independence of an economy before wage labor. No desk. No boss. Every consultant is her own master. Yet for the vast majority of workers the freedom from a paycheck is just the freedom to be afraid. It is the severing of obligations between firms and employees. It is the collapse of the protections that we, in our laws and customs, fought hard to enshrine. After a long history of insecurity in the labor market, not until the mid-twentieth century, in the heyday of postwar capitalism, did we find a way to create economic security in America’s wage-work economy—a steady paycheck, health insurance, and quality housing. The New Deal ended this century-long war over who would benefit from rising industrial productivity. New Deal policy embedded security into a particular kind of industrial-era, full-time, employer-employee relations that was itself born of a historical moment when automobiles and aerospace defined the leading sectors of the economy. Policy makers, in ways that are now forgotten, supported business to invest in these radical new technologies, while at the same time making sure that workers got their fair share of the wealth. At the same time, we should not romanticize the postwar period and its associated protections. For those excluded from those jobs—women, Latinas, African Americans, undocumented migrants—the rest of economy was not so glorious, and their work helped make that economy possible. In many ways, as Temp shows, the experiences of the people who were left out of the good postwar jobs became the rehearsal for most people’s jobs today. As the century progressed, these groups would work, but their labor would not be as protected, as valued, as white men’s labor. The New Deal protections remained on the books, but were not renewed along with the economy, making them ever more peripheral; in the end, even white men were not protected from this new reality, contributing to the Trump victory in 2016. Again and again, we must ask the same question: Who counts? At the same time, we must not forget that even for those white men who had the good paychecks, working on an assembly line or in a mine was dehumanizing, backbreaking, and most important, soul-breaking work. Whatever the wages and benefits, humans should not do the work of robots. 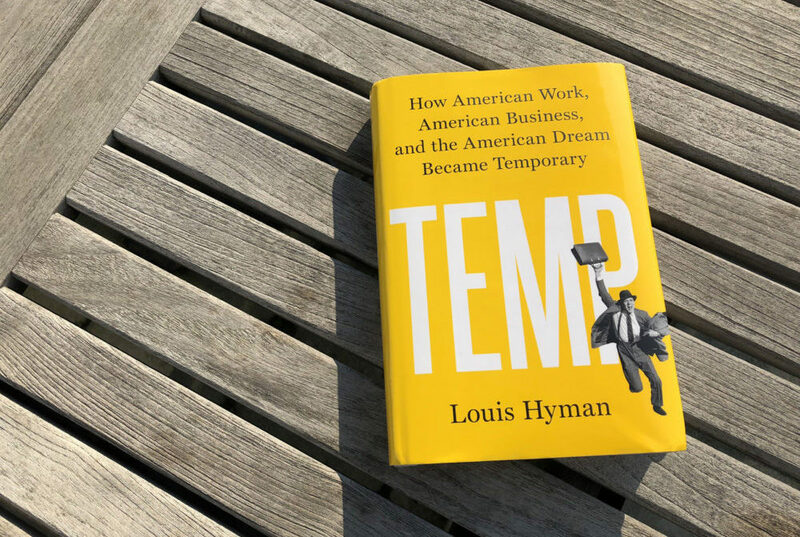 Excerpted from TEMP by Louis Hyman. Copyright © 2018 by Louis Hyman. Reprinted with permission of Viking, an imprint of Penguin Publishing Group, a division of Penguin Random House, LLC. New York Times: "It’s Not Technology That’s Disrupting Our Jobs" — "When we learn about the Industrial Revolution in school, we hear a lot about factories, steam engines, maybe the power loom. We are taught that technological innovation drove social change and radically reshaped the world of work. "Likewise, when we talk about today’s economy, we focus on smartphones, artificial intelligence, apps. Here, too, the inexorable march of technology is thought to be responsible for disrupting traditional work, phasing out the employee with a regular wage or salary and phasing in independent contractors, consultants, temps and freelancers — the so-called gig economy. "But this narrative is wrong. The history of labor shows that technology does not usually drive social change. On the contrary, social change is typically driven by decisions we make about how to organize our world. Only later does technology swoop in, accelerating and consolidating those changes." Technology and the gig economy are driving unprecedented changes in how we work. There's also the threat and promise of automation in every part of our lives. It feels like a 21st century phenomenon. But historian Louis Hyman says if you take the long view, the American economy has been defined by workplace instability. The gig economy was created by choice, not by accident, he says. The question we face now is a moral one: Can American capitalism create a working world where we've got both flexibility and economic security? This hour, On Point: a history of the gig economy, and how the American Dream itself became temporary.